PRO SE PRESENTS: THE PODCAST-EPISODE SEVEN- J. WALT LAYNE SPENDS 'A WEEK IN HELL'! This week, PRO SE PRESENTS: THE PODCAST introduces Pro Se Fans to Author J. Walt Layne and his debut Pro Se novel, A WEEK IN HELL, the first novel in the Champion City Series. Listen and learn about Layne's background, influences, the true life inspiration for Champion City, and his love for pulp crime and the slangy jargon and tough bitten characters that go with it. Tommy Hancock acts as tour guide as PRO SE PRESENTS: THE PODCAST vacations in Champion City with J. Walt Layne for A WEEK IN HELL! NOTED AUTHOR BRINGS HOLLOW EARTH SERIES TO PRO SE IN 2014! 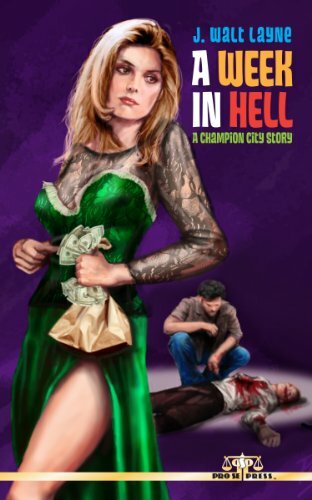 'A WEEK IN HELL'-CRIME PULP BY J. WALT LAYNE- DEBUTS FROM PRO SE!